Please join us for a public meeting tomorrow at Shissler Rec Center, 1800 Blair St., Philadelphia, 19125. We will be recapping all steps we have taken this far, and our strategy going forth. 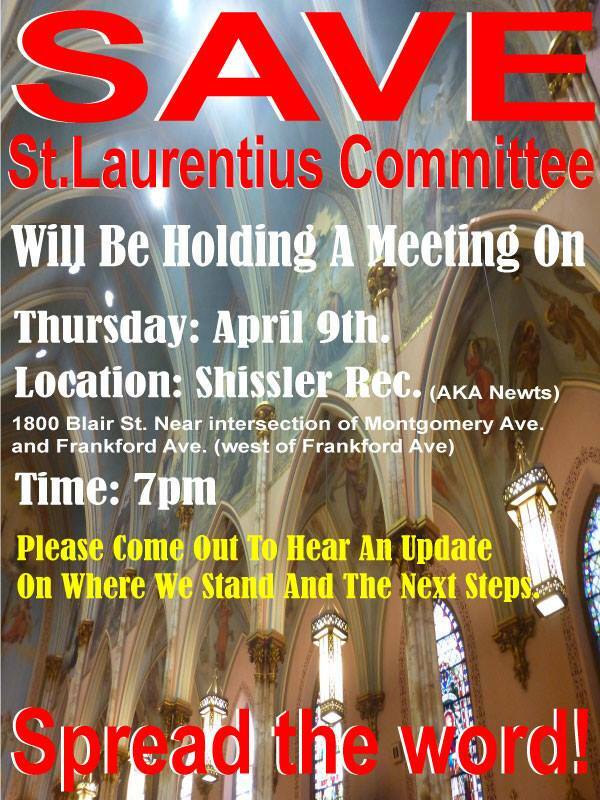 This is a public meeting and everyone who wants to fight to save St. Laurentius Church is welcome. A friend in Chicago told me of an aost identical situation of a polish church that was saved from demolition. St Mary of the angels. The cardinal gate them a deadline to raise funds and the funds were raised. The church is now administered by the Opus Dei priests. Thank you for sharing. I’ll share this with the rest of the committee. This is one of the options we are interested in exploring.